The purpose of this configuration guide is to walk you through the process of enabling the Enhanced Gift Batch interface in your Causeview instance. Enable the Enhanced Gift Batch under Custom Settings. On the left side of the page, you will find a heading called "App Setup" (in some instances, this is labeled as "Build"), expand the Develop menu. Under Develop, click on Custom Settings. Click on the "Edit" button on top of the Causeview App Settings page. 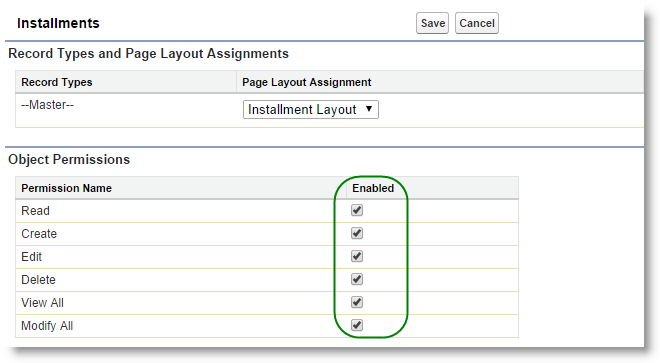 You will find a new setting called "Enable Enhanced Batch Interface". Check the box to enable the Enhanced Gift Batch. New Causeview deployments will already have this preference enabled by default. However, for upgraded deployments, we recommend that you leave this preference disabled until you commit/close any existing open gift batches. 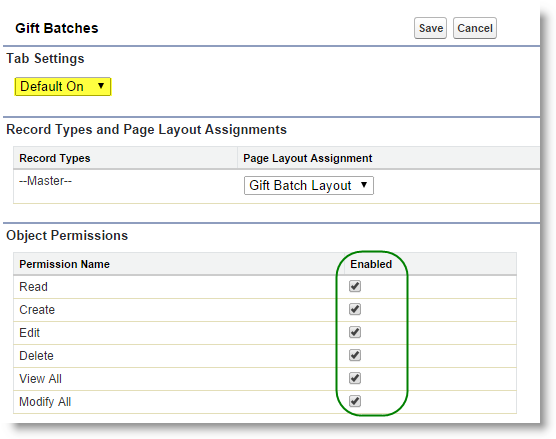 This section of the configuration guide walks you through the process of enabling Enhanced Gift Batch based on user profiles. Go to Setup (see instructions above). On the left side of the page, you will find a heading called "Administration Setup" (in some instances this is is labeled as "Administer"). Expand the Manage Users menu. Under Manage Users, click on "Users"
A page with all of your users will display on your screen. Look for the Profile column. This indicates which user profiles your users belong to. If you do not see a Profile column, just click on a user's name and you will see the profile the user is associated with. If you have multiple user profiles and would like to enable Enhanced Gift Batch for all of them, you will need to perform the steps outlined below for each user profile. In this example, we are going to enable Enhanced Gift Batch for the user profile called "System Administrator". On the left side of the page, you will find a heading called "Administration Setup" (in some instances this is is labeled as "Administer"). 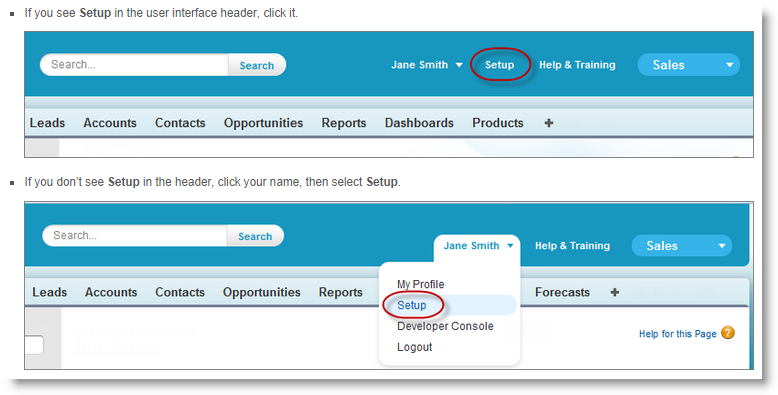 Expand the Manage Users menu and click on "Profiles". In the list of user profiles, click on "System Administrator" (or whichever user profile you would like to have access to the Enhanced Gift Batch interface). 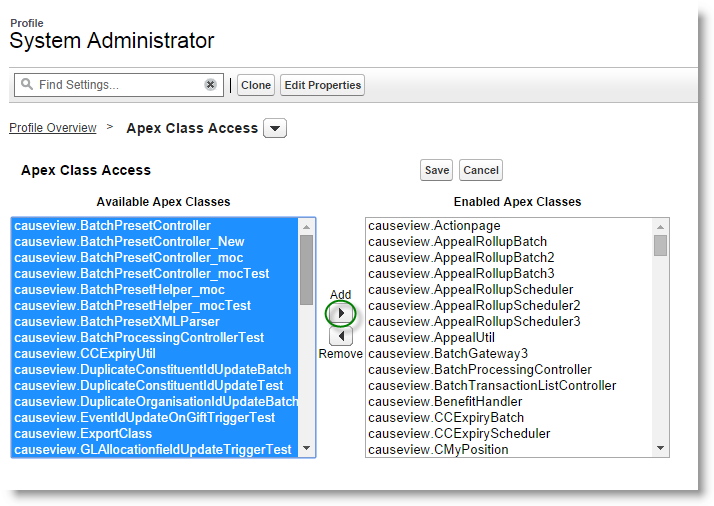 Within the user profile you selected, click on "Apex Class Access"
Then click on the "Edit" button on top of the page. 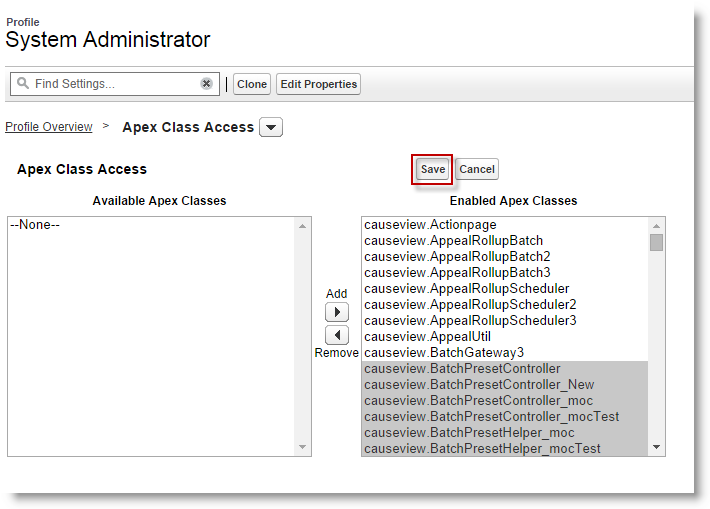 Select all available Apex Classes and use the forward arrow to add them. If you do no see any available Apex Classes, it means all Apex Classes have already been added. 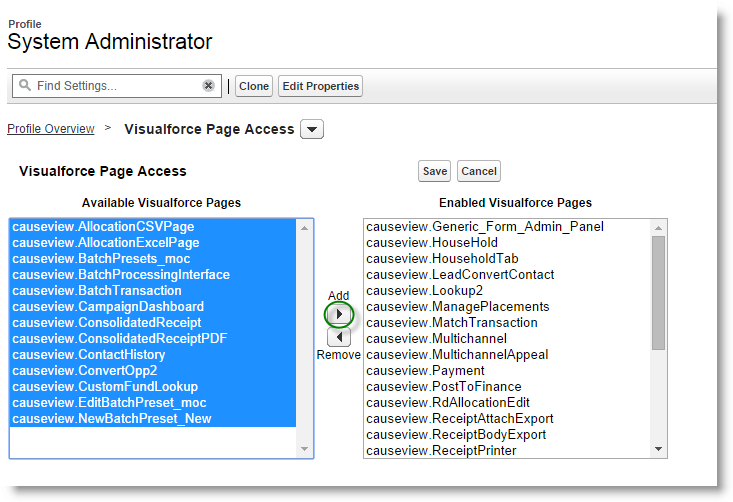 Go back to the user profile you selected and click on "Visualforce Page Access". 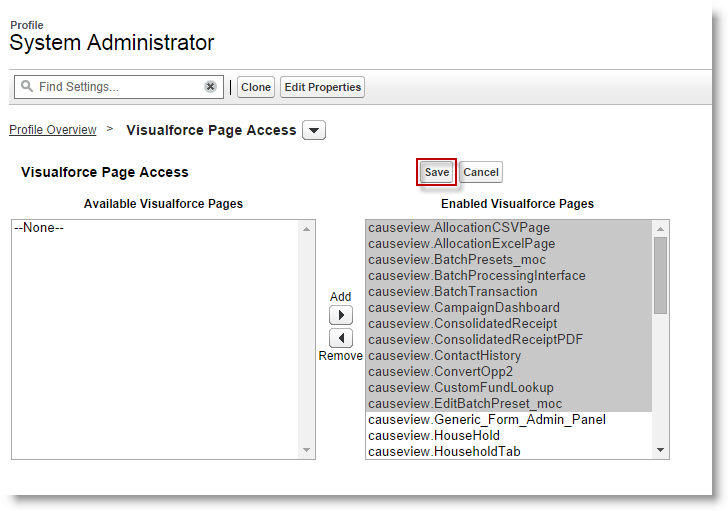 Select all available Visualforce pages and use the forward arrow to add them. 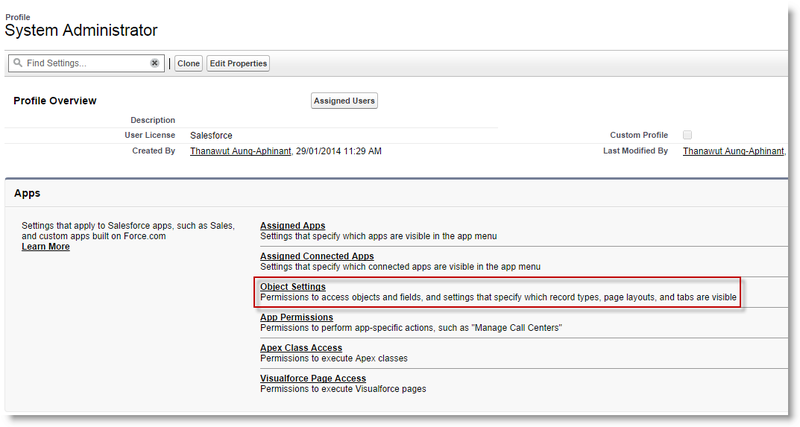 If you do no see any available Visualforce pages, it means all Visualforce pages have already been added. Go back to the user profile you selected and this time click on "Object Settings". Within Object Settings, click on "Affiliations"
Scroll down to the section labeled "Field Permissions" and ensure that both Read and Edit permissions are selected for "Apply Soft Credit". Click on save after you finish. Go back to Object Settigs and click on "Batch Presets" and edit the Tab Setting to "Tab Hidden" and then save. Next, click on " Batch Templates". Edit the Tab Setting to "Tab Hidden". Ensure that the Object Permissions are enabled for Read, Create, Edit, Delete, View All, Modify All. 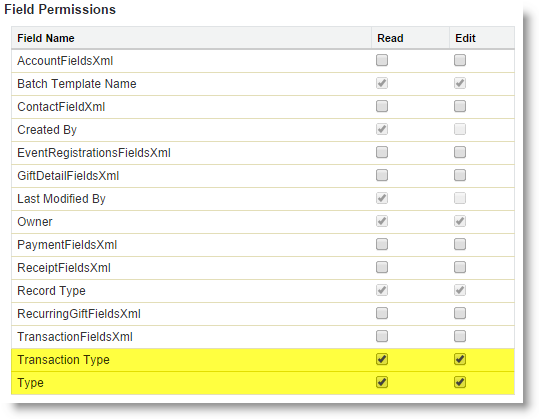 Scroll down to the section labeled "Field Permissions" and that both Read and Edit permissions are selected for Transaction Type and Transaction Fields. Click on save after you finish. Go back to Object Settings and click on "Gift Batches"
Edit the Tab Setting to "Default On". Ensure that the Object Permissions are enabled for Read, Create, Edit, Delete, View All, Modify All. Scroll down to the section labeled "Field Permissions" and ensure that both Read and Edit permissions are selected for all fields highlighted below. Click on save after you finish. Go back to Object Settings and click on "Gift Batch Templates"
Edit the Tab Setting to "Default On" and click on save. Go back to Object Settings and click on "Installments"
Ensure that the Object Permissions are enabled for Read, Create, Edit, Delete, View All, Modify All. 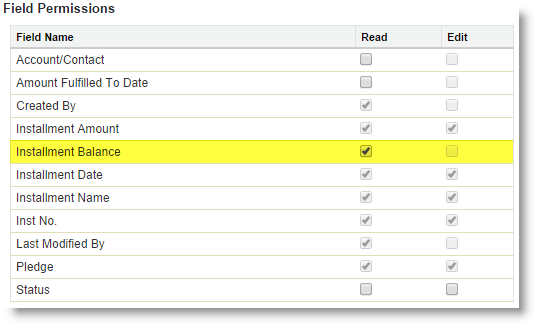 Scroll down to the section labeled "Field Permissions" and ensure that the Read permission is selected for the Installment Balance field. Click on save after you finish. In this section of the configuration guide, you would need to go to the Payment and Gift Batch objects to verify field sets, picklist values and edit page layouts. The field set is meant to streamline the gift batch. Calculated fields and others where it doesn't make sense for someone to enter data in a batch should be in that field. This reduces available fields on a batch template. On the left side of the page, you will find a heading called "App Setup" (in some instances, this is labeled as "Build"), expand the Create menu. 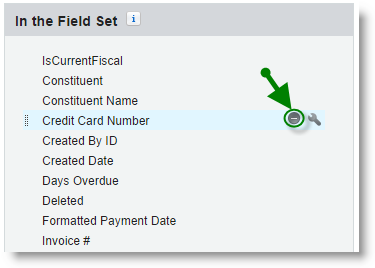 Under Create, click on "Objects"
In the list of Objects, click on "Payment"
Ensure that the following fields are not listed in the "In the Field Set" box. 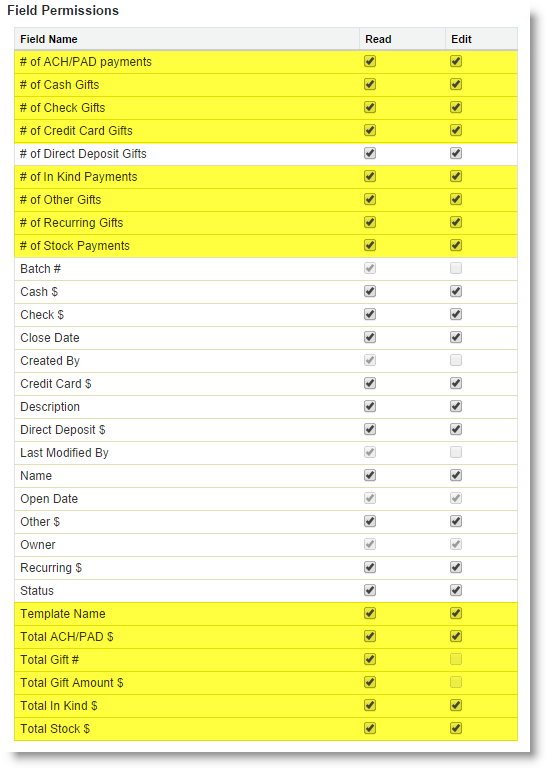 The fields listed in the field set box are fields that will be excluded from the gift batch template. The fields listed below should be in the gift batch template and therefore not added to the field set box. If any of the above fields is in the list, hover over the field and click on the remove icon. 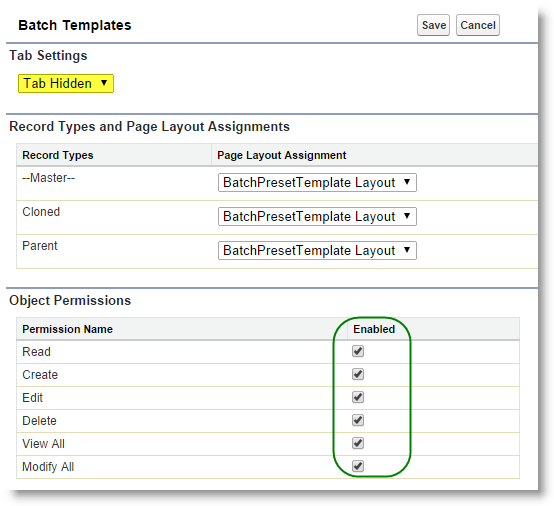 Go back to the Field Sets and click on "Edit" beside Required Fields for Batch Template. Make sure that the following fields have been added to the field set. After checking your field sets, you now need to verify your payment type picklist values. 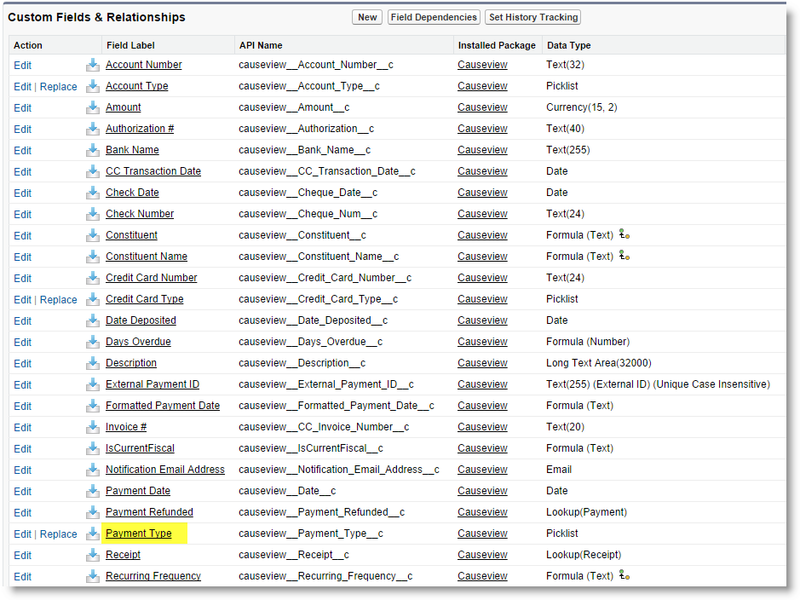 Within the payment object, look for the section called "Custom Fields & Relationships" and click on the field "Payment Type". Then within the Payment Type field, scroll down the page until you find a section called "Picklist Values". If you process Credit Card and/or ACH/PAD payments, make sure that the payment type picklist contains Credit Card and/or ACH/PAD exactly as it appears in the picture below. If they are entered any differently than how it appears below, it will not function properly. If the label doesn't match, you can click on Edit beside a value to change the label. 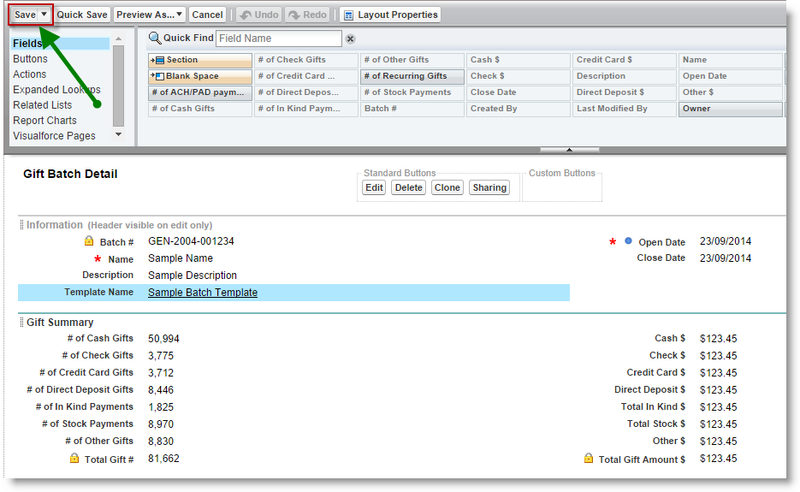 Next, you need to edit the Gift Batch Page Layout to include the Template Name field. In the list of Objects, click on "Gift Batch"
Within the Gift Batch Object, scroll down through the page until you find a section called "Page Layouts". Click on "Edit" beside Gift Batch Layout. 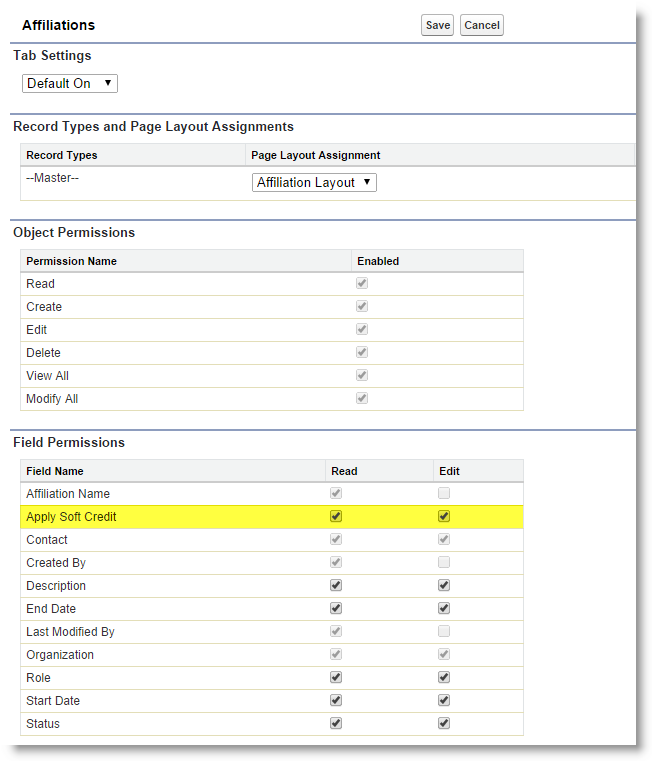 Drag the "Template Name" field under the "Description" field in the Gift Batch Detail page. After adding the Template Name field, on the page layout, click on "Save".